After their overtime victory over the Arizona Wildcats Saturday, the Washington Huskies dropped a spot, to No. 10, in this week’s Associated Press poll. 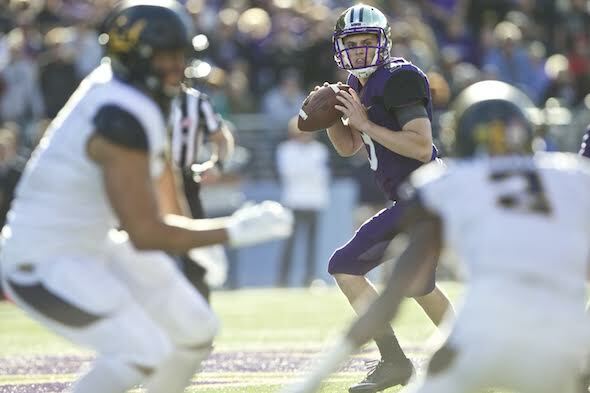 The Washington Huskies dropped a spot, to 10th, in this week’s Associated Press college football poll released Monday despite — or perhaps because of — their 35-28 overtime victory over the Arizona Wildcats Saturday night in Tucson. UW (4-0) will host No. 7 Stanford (3-0) Friday at 6 p.m. at Husky Stadium — the first meeting of Top 10 teams in the facility since the third week of the 1997 season. That year, No. 2 Washington hosted No. 7 Nebraska and lost 27-14. The Huskies never rose further the rest of the season, finishing 8-4 and 21st after defeating Michigan State in the Aloha Bowl. The Huskies received 986 points in the latest AP rankings and are sandwiched between No. 9 Texas A&M (1,036) and No. 11 Tennessee (909). Stanford received 1,166 to remain No. 7 for the second consecutive week. Washington enjoyed its highest ranking of the season, No. 8, two weeks ago. Alabama (4-0) remained No. 1 with 50 first-place votes and 1,511 points. Ohio State is No. 2 with four first-place votes and 1,440 points. Louisville is No. 3 with six first-place votes 1,409 points. In the coaches poll, Washington is ninth and Stanford No. 6. As of Monday morning, the UW athletics department said about 2,000 tickets were available for only the second week-night game in Husky Stadium’s post-World War II history. The Huskies on Nov. 18, 2010 beat UCLA 24-7. The Huskies also played a Thursday night game in 2012, beating Stanford 17-13, but that was at the Clink during the UW stadium renovation. Among Pac-12 schools, Utah (4-0) made the biggest advancement in the AP rankings, moving from No. 24 to No. 18 after defeating USC in Salt Lake City. No other conference school cracked AP’s Top 25, although Arizona State (135), Colorado (33) and UCLA (22) received votes. Before the 1997 Washington-Nebraska game, both UW and its opponent had Top 10 rankings in 1982 (No. 10 UW defeated No. 9 UCLA 10-7) and 1962 (No. 10 UW and No. 7 Purdue tied 7-7). Washington has dropped nine of its past 11 contests with Stanford, including three in a row and 31-14 last year in Palo Alto. The Huskies’ Oct. 8 game at Oregon has a kickoff time — 4:30 p.m. on FOX. Many from other conferences do the same. If you are saying that the old east coast bias has reared its ugly head again, then yes, I agree. The Arizona game was a blessing — a road game in a tough venue against a respectable opponent. And the Dawgs were forced to win it at the end. It was sloppy but, all in all, a good warmup for Stanford. The top ten ranking is a joke; they have done nothing yet to earn it. If they beat Stanford, then it will actually mean something. Petersen said today that the game was good prep after the French pastry. And all polls except the final are meaningless. They’re designed to stimulate interest.